Editor’s note: Due to the translation of this article from German, you may have to make some allowances for the grammar. Extensive investigations in recent years have shown that many older structures, and in some cases whole communities, are in large part free of geopathic radiation. This absence of irritation zones in areas of human habitation has been observed in central Europe, Copenhagen, Rome, Spain and Venezuela. It may be assumed that this phenomenon is to be found in older settlements world-wide, where stone is used for construction. This state of balance and protection can be vulnerable with modern construction techniques, and in a number of cases, this protection has been disturbed by steel-and-concrete structures, for example, which have been erected between older houses, and by the large refrigeration units commonly used in hotels. Yet for a dowser, it is always a pleasure to find these balanced areas clear of geopathic zones in old cities, villages, and individual houses. We are talking here about all kinds of irritation (“noxious radiation”) zones, such as water veins, geological faults, and grids of different kinds, which all have their effects on living things. In this connection, geological faults appear to have particularly noxious qualities. The method of interrupting this irritating radiation is generally through the use of polarised stones or bricks. In this procedure, the balancing or healing is achieved when the positive side of the stone or brick is placed facing upwards. The foundations of older buildings are particularly effective in activating this clearing, and it seems to be necessary for some of the stones or bricks making up the structure to be located below ground level in order to balance out harmful vibrations, and to achieve harmony with the Earth. Stones and other objects can be polarised by striking them. Thus, stones can be laid around a house, and then be hit with a heavy hammer in order to achieve the correct polarisation. The struck side will be positive, and a wall of such stones or bricks will balance and neutralise the effects of geopathic zones. This method has been applied successfully many times. The use of correctly polarised stones is very old in all cultures, and appears in the earliest known stone buildings. Thus, our observations begin with megaliths and other ancient stone constructions, whose age is now generally assumed to be greater than that of the Egyptian pyramids, where polarised stones have been observed, but not yet systematically researched. 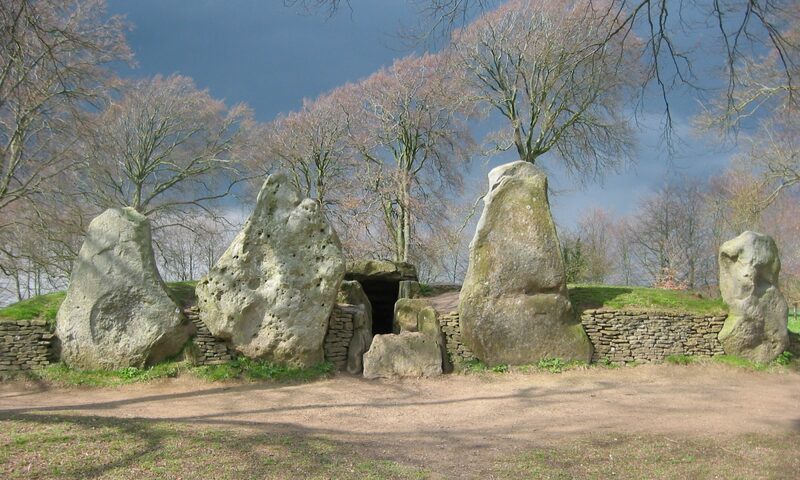 At megalithic sites, the stones are placed with the positive side turned inward in order to send the positive energy into the centre of the space. This may also be generally observed in churches. These principles of building with polarised stones, which were first observed in an old sheep stall on the Lüneburger Heide (Heath) in Northern Germany, are once again available to us, as this article will report. Nearly all buildings built before l900 had their energies balanced by this means, whether they were houses, churches, city halls, castles, palaces, or large festival halls. The irritating radiation recognised by the dowser is made up of different components, as has been shown many times, and physical research indicates that not just one component, but many are active, exactly as in the observations made on plants, in which it has been demonstrated that some plants may even be used as bio-indicators to detect the types of zones. When the components that we regard as noxious are neutralised, others remain in force, which people (and perhaps animals) can apply for their own purposes. Thus we come to the sacred realm, and we find that in churches, just as at megalithic sites, these energies are used in order to lend the priest special powers. Therefore, we may regard the ancient megalithic sites as places of initiation, and not just for the burial of the dead. Certainly they served other cultural purposes as well. This becomes especially clear when we see, as Kehnscherper writes, that the dead was left outside the grave until the decomposition of the body was complete, and subsequently the bones were buried. Some of these traditions are still practised among certain orders today, in which the initiate spends time in a dark room with a human skull in order to reach further levels of enlightenment. Whether or not special powers are associated with the bones themselves is not something that we will research here. Perhaps this rite is only to make clear the passing nature of our life. Two experiments will be described here by which the effectiveness of polarised stones can be observed. A cabbage plant that grew over the crossing of two water veins was completely overrun with caterpillars. Six or seven polarised fieldstones were laid around the plant with the positive side up, and after about three days, the caterpillars had disappeared. The effect of the water-vein crossing was to lower the natural resistance of the plant, which allowed the caterpillars to attack. When the stones were placed, the effects of these energies were removed, and the plant was able to re-establish its own defences, causing the caterpillars to withdraw. Similar behaviour has been observed by Professor E. Jahn in the case of forests plagued by damaging insects, where the plants suffering the most were located on crossing points of irritating energies. It is well known that fresh cow’s milk will sour in a few days. In this experiment, a small amount of milk was taken each day from test vials. The degree of sourness that had developed was measured by titration with a thinned sodium mixture to check for enolpthalene as an indicator. Because of the difficulty in determining the final results of this reaction, Christina Otto, a chemical scientist’s assistant from the Milk Institute assisted us with the experiment. It was clearly shown that the degree of souring after three or four days varied considerably from one vial to another depending on whether the milk had been on, between or next to the polarised bricks. This experiment, which has been repeated many times, is a clear demonstration of some of the effects that polarised stones can have on living things. There is no doubt that many living things can be affected by the use of polarised stones, and people can enjoy better health when irritation zones are balanced (rendered harmless) by this method. This is part of the experience of qualified dowsers. Not every neutralising device offered to counteract the effects of geopathic irritation is effective over long periods of time. Such devices should only be used after a client’s bed has been moved to avoid the problem zone. The use of polarised stones in sufficient quantities appears to be the best method in such cases, as has been consistently shown in the past. Economising through a sparing use of stones is not desirable here, as one of the following examples will show. The price (in Germany) of correctly polarised bricks is not greater, and their effect is long lasting. Certain sources of irritating energies have already been noted. Modern construction techniques have not made it possible to avoid these entirely, but an experienced dowser will be able to provide remedies quickly and without great cost. Today, we can once again employ this ancient building knowledge in construction. In recent years, a fair number of houses have been built according to these ancient principles, and have been shown to be free of geopathic disturbances. Although today it would be too expensive to inspect each stone, there are several ways to employ polarised stones. Small quantities of correctly polarised bricks are again available to us, so that we do not need to depend on fieldstones, though these, also, can be used successfully. Unfortunately, co-operation with the brick-production industry is not yet so far along that properly polarised bricks can be made generally available, with the result that transport over long distances may be involved. However these bricks are not more expensive than normal ones. Prior to construction, any site should be inspected by a dowser competent to deal with detrimental radiation. It is important to have the dowser return when the building is complete and the occupants have moved in, for we have found that about 58% of new houses built with polarised bricks or stones did not remain clear, and a certain amount of irritating radiation may return. This can result from the construction activities themselves, or other disturbances nearby. The skills of a dowser experienced in this field are essential for this verification. The chief in charge of construction is an experienced dowser, and one of the first things done was to place large stones that had been polarised by a number of heavy hammer-blows over the irritation zones, which in this case were water veins and geological faults. In this operation, the positive side is placed facing up, and balancing of the energies takes place. The areas between the noxious zones were not laid in with stones, in contrast to the type of construction found in older buildings. In this case, all the geopathic disturbances in the living area were removed. After about three years, a new water line appeared with geopathic components. This was brought in by a large new construction project next door. The new zone, however, does not disturb the beds or the working places of the inhabitants, so it did not require further work to be done on it. From this example, we can learn that the whole house should be surrounded with polarised stones. Further possibilities exist in the re-use of older foundations. This was the case where an old farmhouse was completely renovated with new building materials. A cellar was added, which was built of correctly polarised bricks, and the ceiling was built vaulted. Because of this, the cellar is free of geopathic energies. Vegetables can be kept there longer without showing signs of decay. Here, the same phenomenon may be observed in a storage cellar with correct construction, and it was shown that vegetables kept fresh longer. This cellar was built of polarised bricks with a vaulted ceiling. The resulting polarisation can also be transferred to water placed in the cellar. Water that dowses as “negative” becomes “positive” after several hours. The remarkable effect of this radiation, or should we say, polarity, is also found in older wine cellars, where it improves wine that is stored there over long periods of time. A new wooden house was built on an old foundation, and more masonry was added using polarised bricks. This included the installation of a chimney. In building a chimney and fireplace, the bricks should be set in with the negative side placed facing the open inside of the chimney in order to provide the necessary draught. Two further wooden houses having no cellars were built with correctly polarised bricks in the foundation. The result was the complete elimination of the geopathic disturbances. A house was erected when no correctly polarised bricks were yet available. In this case, a trench three feet wide and four feet six inches deep was dug around the house, and partly filled with gravel. Field stones six or seven inches long were laid on top the gravel, and then individually struck with about five heavy blows of a hammer from above, and the noxious radiation was immediately interrupted. Another layer of similar-sized fieldstones was laid to a depth of 20 or 30 inches, and struck. ‘The number and strength of the hammer blows is important, as is the mass of the individual stones. It is difficult to polarise stones which are bigger than those described here by hitting them with a hammer, and smaller stones do not have a sufficient mass to do the job. In this case both the construction chief and the architect were operating on a low budget. These men wanted the entire foundation to be made of sandstone. A ring of polarised bricks was to be laid to the height of 12 courses. This did not suffice – the bricks were not in the earth, so they were not grounded. In spite of this, our inspection showed that noxious zones registering strength of eight outside the house were reduced to five inside. In another part of the house, which does not have a cellar under it and therefore has no steel-and-cement floor, the strength of the irritation zones was reduced from eight to three. As this was not completely satisfactory, a ring of polarised fieldstones was additionally laid around the house. In this case, the original recommendation of the dowser was not followed, and only supplemental measures led to the desired result. In the case of a half-timbered house with no cellar, flagstones were laid around the house at intervals of about 10 yards with the positive side up. Further, the floor was finished using stones with the positive side up. The balancing out of the detrimental zones was complete. Next to this house, a well at a depth of about 50 feet was located. This house had been built without the particular purpose in mind of interrupting the disturbing energies. It was built simply at the request of the client, yet it was free of harmful radiation’s, that surprised us. Investigation, however, showed the cause of this balancing to be the use of the polarised stones. In this case, no large foundation was necessary, so that with the relatively few flagstones, which furthermore lay only on the surface of the earth, a positive effect was. achieved. In this case, one layer of large stones surrounded the house to a depth of about 3 feet. These stones were struck from above five times with a large tamping machine. ‘This was sufficient to polarise them correctly and to balance out the geopathic zones. It is not necessary that the stones are hit by hand, and a tamping machine can be used if it is more convenient. The material presented here shows that today it is once again possible to live as our ancestors did, without geopathic disturbances, for the necessary bricks are now available. The verification of the complete balancing out of detrimental energies remains the purview of the experienced dowser. Just as an experienced water dowser is employed to locate wells, a dowser with special experience in the balancing of radiation is essential for the work described here. Only such a person can assure that both the clearing of the site and the subsequent verification are performed correctly, and that the results are dependable.